A chandelier is the perfect way to add elegance and softer lighting to the bedroom. When considering the perfect chandelier for their bedroom, buyers must not only consider design and style, but establish size and type of chandelier needed as well. The room will need to be measured in order to determine the proper size of the chandelier. Then style and design can be considered in order to fit that particular room’s décor and the buyer’s personal preference. There are many sizes of chandeliers to choose from, so measurements of the bedroom should be taken to ensure adequate lighting of the room. A tape measure is the only tool needed to ensure accurate room dimensions. The first measurement is of the length and width of the bedroom. Length and width of room should be recorded in feet, and added together to find the corresponding diameter of that room’s ideal chandelier. For example, a room with a width of 10 feet and a length of 11 feet would give you 21 feet when added together. Therefore, a chandelier with a diameter measuring 21 inches would be the appropriate size for that specific room. The second measurement a person should take of the bedroom is the height. If the room has high ceilings, then a mini chandelier just wouldn’t provide enough lighting. If the room has low ceilings, then a hanging or pendant chandelier might not be the best option. 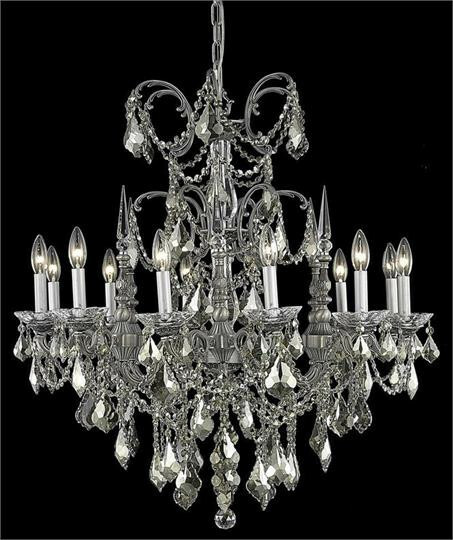 A good rule of thumb for chandelier height is 3 inches of chandelier per foot of room height. Also, for safety reasons, a chandelier should hang no lower than 6 feet above the floor. With these measurements in mind, a buyer can now establish what size and type of chandelier is most appropriate for their particular room. A grand chandelier for larger rooms, and for rooms with high ceilings, a hanging chandelier. For rooms with smaller dimensions, perhaps a mini chandelier would be more appropriate for adding elegance without overpowering the space. And for a simplistic yet stylish take on chandelier décor, a pendant can be a more modern approach. Next comes style. Is the space contemporary or modern, traditional or sophisticated, or have a rustic ambiance? Or is there a specific finish for the chandelier that would tie the room together; perhaps either black, chrome, gold, or white? All options and variations should be considered. In addition to style, buyers should consider how bright they want their room to be. Chandeliers are excellent sources of soft lighting, so buyers should follow the recommended wattage for the specific chandelier, or look into purchasing a dimmer for even more control. In either simplicity or elegance, a chandelier is the perfect way to add soft lighting and a sophisticated element to any bedroom. With proper measurements and an eye for design and style, any buyer can find a chandelier to fit their particular bedroom décor.